You'll love how easy this garter stitch hat is to make up. In fact if there is such a thing as 'too easy' this easy hat pattern is it. And you'll probably want to make more than one. So gather up a bunch of your favorite color knitting yarns and start knitting some hats for all your friends and family. 1. Because I want beginner knitters to be able to knit some fun and easy knitting projects as they learn how to knit. Maybe all you learned so far is the knit stitch. Well, that is just great because now you can make this garter stitch hat. Just because you are new and still learning to knit doesn't mean that you can't make anything. And I want you to experience early on as you're learning, just how cool it is to have something that you actually made. It just feels so darn good and that's what knitting is all about. 2. For experienced knitters who love quick knits and a quick pick-me-up after a long project this hat pattern is for you. I love these kinds of knitting projects. Don't you? This hat can be worn two ways: as a slouchy hat or as an extra warm and snugly hat by folding up the brim so that it fits nicely on your head. Pattern Notes: Gauge is not important for this knitting project as I mentioned. The main reason for this is that Garter stitch is extremely stretchy. 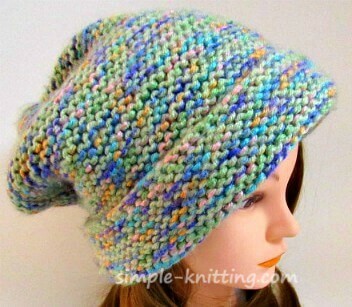 This easy hat pattern will fit many different sizes. Just an idea: If you have some leftover yarn, have some more fun knitting and make up some fingerless mittens too. Then you’ll have a nice set. Knit garter stitch for approximately 12 inches. Bind off leaving a long tail. (The long tail is used to close the top of the hat). Thread a tapestry needle and beginning at brim, sew up side seam creating a tube. Then with tapestry needle weave in and out of bind off stitches pulling tightly to close the hole. Weave in the ends securely.